Amazing (live, Oy Vey Baby, 1991). “Amazing” came out of Bowie and Reeves Gabrels’ composition binge of late summer 1988. Possibly inspired by Bowie’s relationship with Melissa Hurley, which was still in the honeymoon stage during the Tin Machine sessions, the lyric’s as plain-faced as Bowie ever got, though it’s not quite the unalloyed declaration of love—the singer fears his lover will finally realize their relationship is superficial (“I’m scared you’ll meet someone in whom you’ll confide,” while in the second verse he’s having nightmares about her leaving). Still, the (deliberately?) banal chorus keeps to the pleasures of the moment. A power ballad of sorts in E major, “Amazing” has a touch of drama with its shift to the parallel minor in the chorus, and on the whole it’s not too far removed from post-comeback Aerosmith (even the title’s very Diane Warren). The Machine’s attempt at an Eighties hard rock ballad is full of tension and unease, however. Bowie likely took his initial verse melody from Gabrels’ ascending stepwise scale playing, while his later emphases are off-kilter at times—take his thudding “girl,” which he hammers as he sinks nearly an octave, disrupting the earlier, soaring sense of development. And the rhythm section is a ball of agitation, with Hunt Sales in particular seemingly on the verge of going off on a tear with every fill. Still, there’s some fine acoustic guitar work here (likely Kevin Armstrong); Gabrels’ seagull-cry feedback in the intro is interesting, if pointless, while he gets off a couple of sonorous lines between choruses. The producer Tim Palmer said that Bowie shelved many of the more melodic pieces from the Tin Machine sessions so as to offer a bristling front for the Machine’s debut: this contributed to the sense of exhaustion one gets when enduring the record as a whole. In that context, the track’s place in the sequencing—leading off the album’s second side—makes “Amazing” seem like a happy spot of relief, even if the track is a barely-held ceasefire. Recorded ca. August 1988 at Mountain Studios, Montreux, and/or Compass Point Studios, Nassau, Bahamas, ca. November-December 1988. A live version from the Academy, NYC, in 1991 is on Oy Vey Baby. 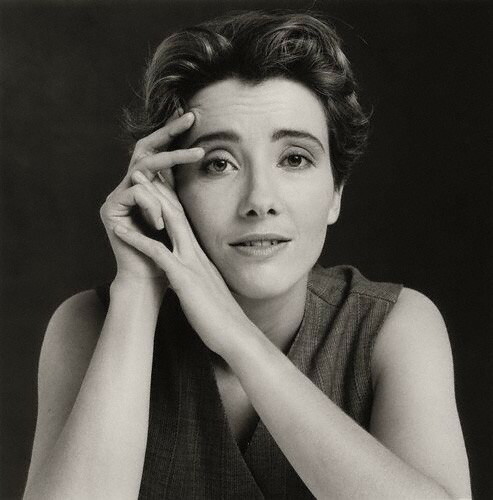 Top: Tim Richmond, “Emma Thompson,” 1988. During the era of her short-lived and fervently unfunny comedy show, Thompson. This entry was posted on Tuesday, May 1st, 2012 at 9:31 am and is filed under Tin Machine: 1989. You can follow any responses to this entry through the RSS 2.0 feed. Both comments and pings are currently closed. What can I say. Iggy does this sort of thing better. Oddly the music (as in the instrumental part, the band) actually reminds me of late Roxy Music/solo Bryan Ferry, more than a late 80’s hard rock ballad. Not a bad song but a bit blah. Blah melody, and for a love song…I don’t quite believe Bowie he means the simple lyrics he’s singing, if that makes sense. Gabriel’s ascending riff aside, an unconvincing tune, not least because I can’t imagine thinking anybody’s love is amazing. I must admit that this is one of my all-time favorite TM songs ever, I fell in love with it instantly, and I find it a convincing Bowie love song to boot! I’m not as convinced by the live Oy Vey rendition however but in the studio Mr. B’s vocal delivery and the tune’s Hendrix-like drama are excellent. Gabrels’ guitar phrases and overall sound are evidently inspired by Fripp’s guitar licks on No Pussyfooting. Perhaps this song could have been a smash hit. Well it’s certainly not ‘amazing’ but a pleasant tune. Not exactly high praise I know but still notable for this Bowie period. It’s a shame the song tails off in the last 20 or 30 seconds. Seems like they don’t know how to end it so they fade out during some instrumental and vocal improvising. Thanx Chris, your energy in this project never ceases to amaze (and delight) me. I’m with Frankie – I loved this song the first time I heard it and I still do. A pity he didn’t allow more songs like tis on the LP for balance (as has been pointed out…). For some reason I can totally relate to this song. One of the better songs to come out of a fairly atrocious period for Bowie. I’ve always liked this one, if only because it’s one of the few TM tunes where Bowie ditches the douchebag persona and actually sounds vulnerable…. Re photo caption: Short lived and fervently unfunny — also describes her marriage to Branagh, surely. Pleasant enough but hardly ‘amazing’ , the best tin machine material or most interesting is the angry stuff crack city etc. I think they over shadow this more placid material just because of sheer power and cringe worthy lyrics. Let me confess that my ex-wife and I chose this song for the recessional at our wedding, back in 1995 (the bride wore black, the groom, black shorts, wallet chain & bull’s blood Doc Maatens). We liked the fact that it’s a romantic ballad with a dissonant, metallic “hardness” that sort of characterised where we were at back then. Still brings back fond memories of those days and affection for the ex. I think we pissed off her folks, as well. Aerosmith have a power ballad of the same name, a few years later, when they were autopiloting ballads.